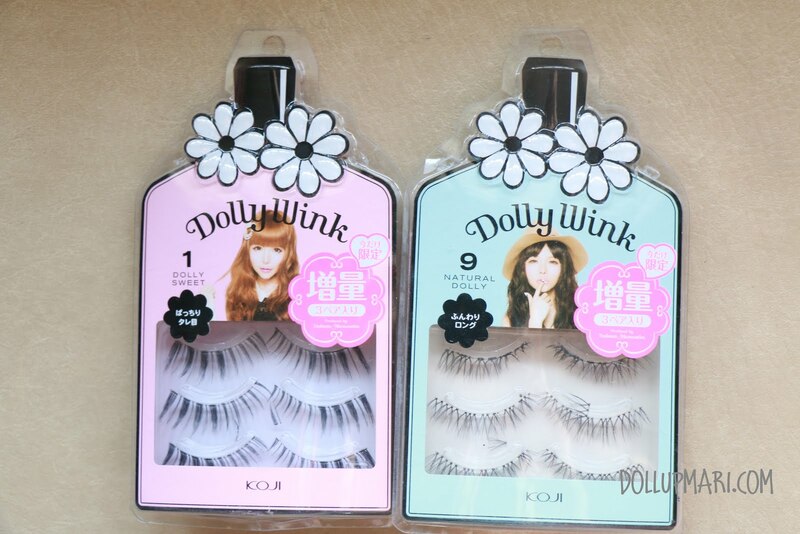 For months now, I've been trying to look for a Dolly Wink seller here in the Philippines. I asked around in some makeup artist groups in Facebook, only for very vague answers to come up. A lot of them were insisting that they saw stuff in Beauty Bar, but at the time my visits to Beauty Bar have proven futile and there was just nothing. A lot of the people's memories were from years back, I think. I think Beauty Bar did carry some of the items of the brand for a short time back then, but not now. I was told to go to bigger branches, but there just seemed to be nothing. Even the gigantic BeautyBar TriNoma branch didn't seem to have anything. I also tried to contact online resellers of Japanese makeup and beauty products, but I'm not sure if they're busy or if I'm not important to them but all my inquiries just didn't come up with any replies. That's why I was so happy when I saw a Dolly Wink Philippines account on instagram. 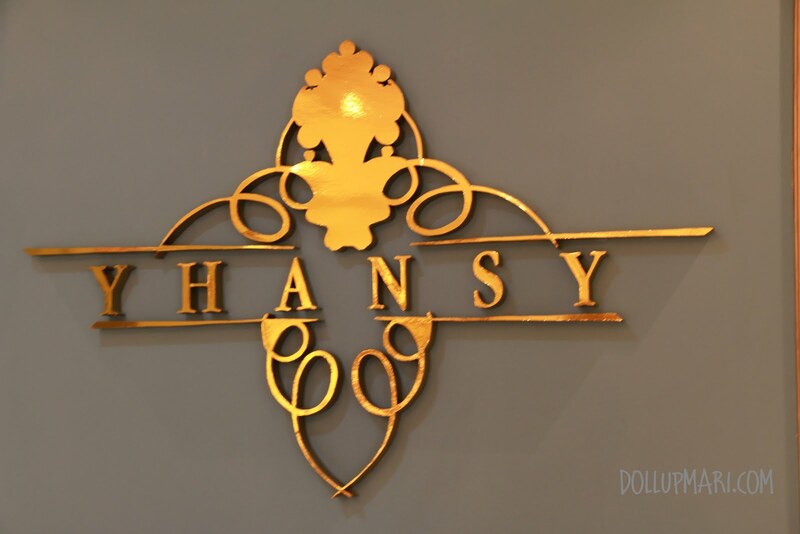 They said that they had an outlet in Shangri-la Plaza and all, but since we're surrounded with SM North, TriNoma, and the other malls nearby, we rarely visit Megamall and Shang Plaza. 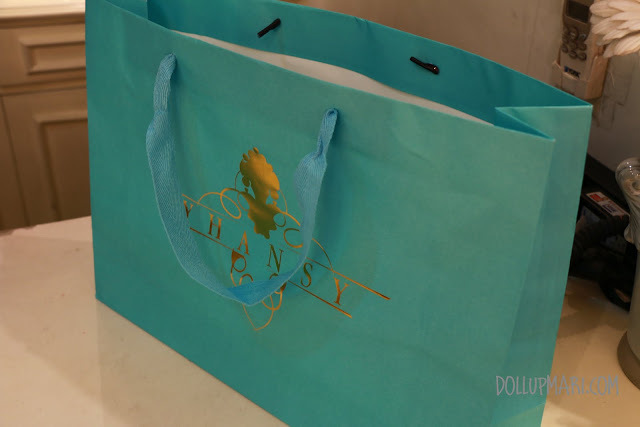 For those who are encountering this brand for the first time, in a nutshell, Dolly Wink is a brand manufactures by Koji corporation, and the designer and producer behind it is Tsubasa Masuwaka. Tsubasa was a former Popteen model, and her work with the magazine launched her to stardom. Tsubasa was known for wearing lashes on the lower lashline, and at the time there were no formal brands dedicated to lower lashes that she used upper lashes on the lower lashline. 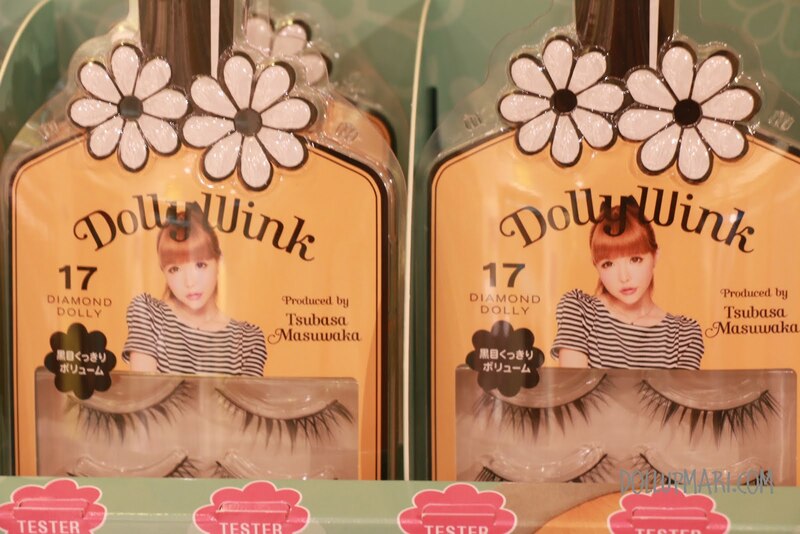 Her fame, combined with demand among the gyaru community, led to such a great demand for lower lashes and great upper lashes in general that Dolly Wink was born. 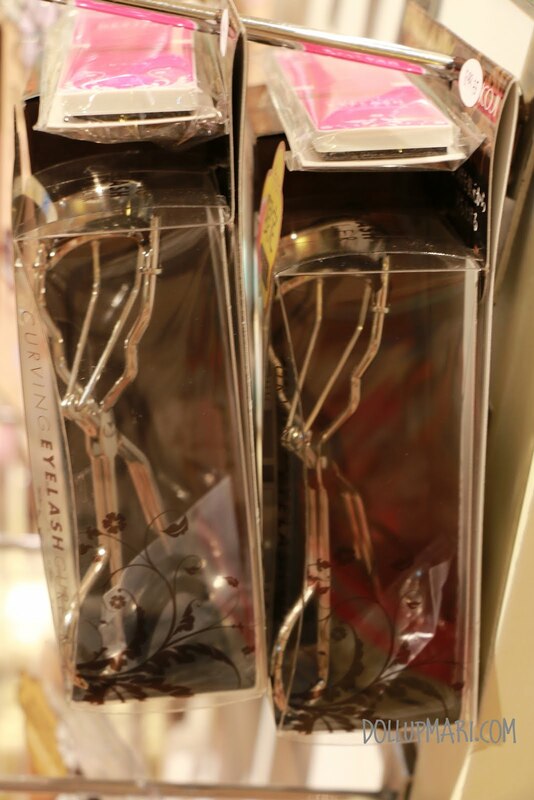 They're also one of the first legit eyelash brands to make the bands transparent so you can wear the falsies without eyeliner and expect a natural finish. 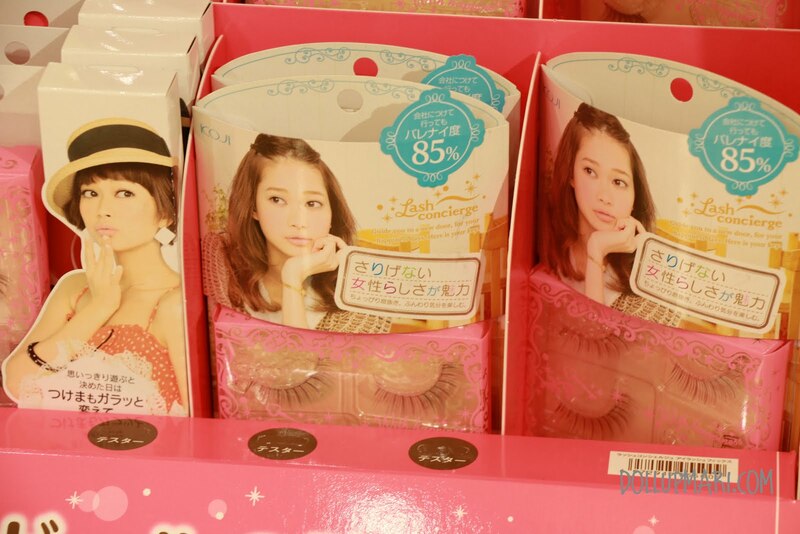 Other the Koji brand also comes eye talk (the pink bottle in the right), and other items in its brand such as eyelash curlers and other eye products. This is a newer line they have called Lash Concierge, and it's also under Koji. So one Sunday, my mom was going to Shang Plaza because she was interested in buying a mid-range oven. She also wanted to check out the GE Monogram store. I went there without any memory that the Dolly Wink store was there, and while waiting for my brother so thop at Shoe Salon, my mom and I were strolling when I finally saw Yhansy and all the DW stuff inside. 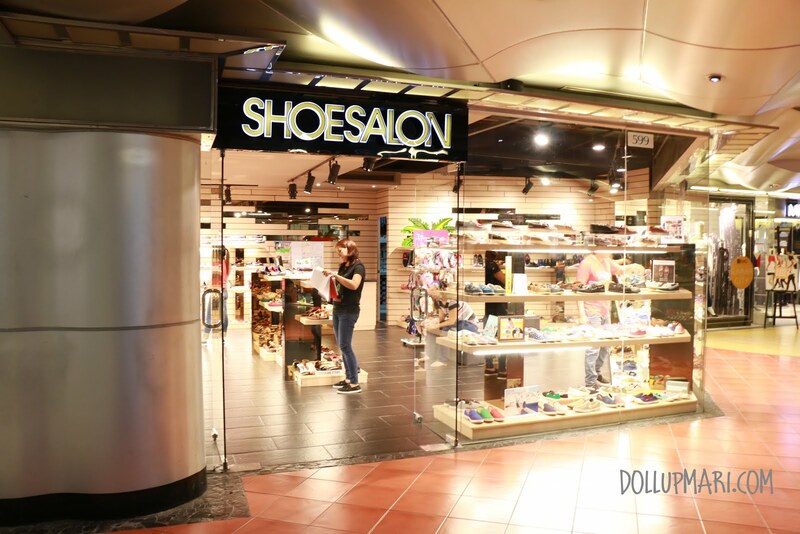 This is the fifth floor of Shang Plaza, the wing with Shoe Salon. On its right is a fork on the road with a folded and hung store in the middle. If you go to the right side of the fork, you'll get to Yhansy. The moment I got here I was squealing like a little girl because never in my dreams did I even expect that the complete Koji lineup would ever be in the Philippines. I was like in my favorite stores in hong Kong, Sasa and City Super. I was so impressed with my first visit that I just had to come back and take all these photos to share with you. 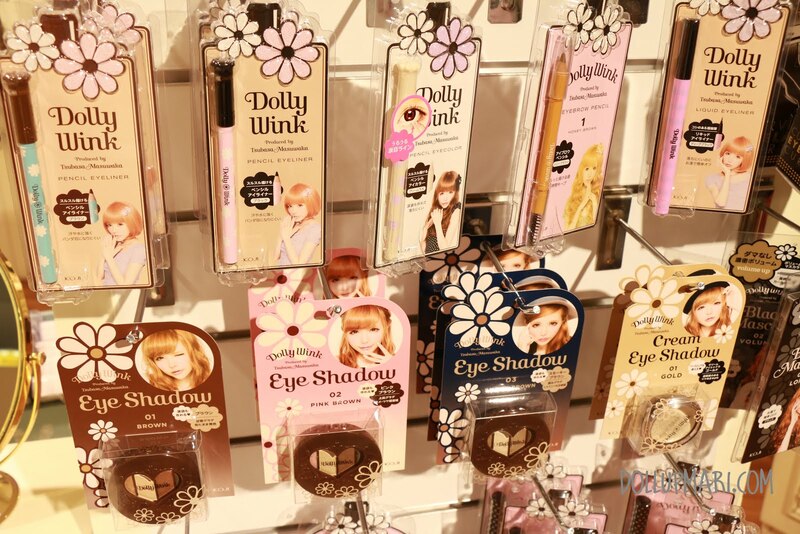 So they have the complete Dolly Wink line. They have the eyebrow powders in honey brown and chocolate brown, except the #3 shade whose name I can't recall right now. 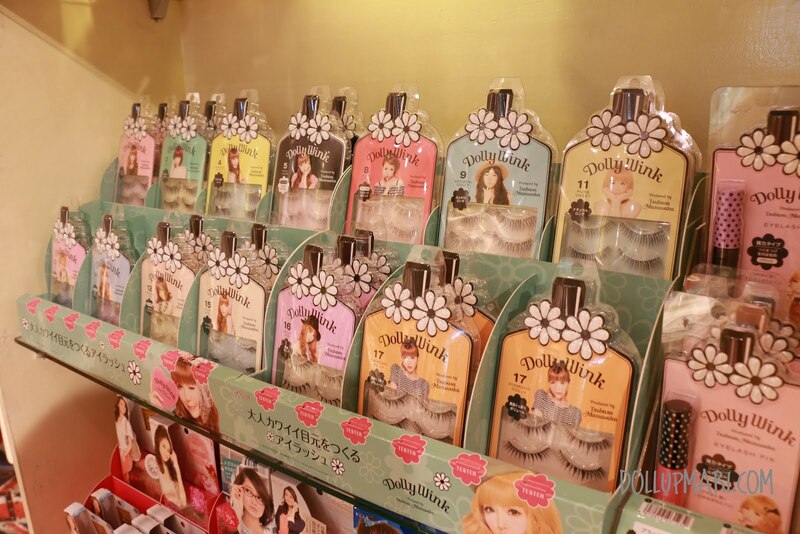 I personally own one of each of these eyebrow powders. 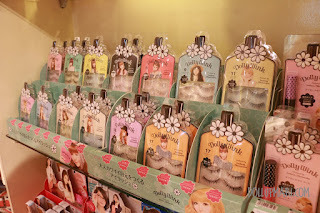 Each one is at Php650-700 if I remembered correctly, basing from what i paid for when I got mine (as I bought my eyebrow powders in Taiwan and Hong Kong). I didn't like #3 as it was too dark which is why I don't have any concrete plans to get it anytime soon. 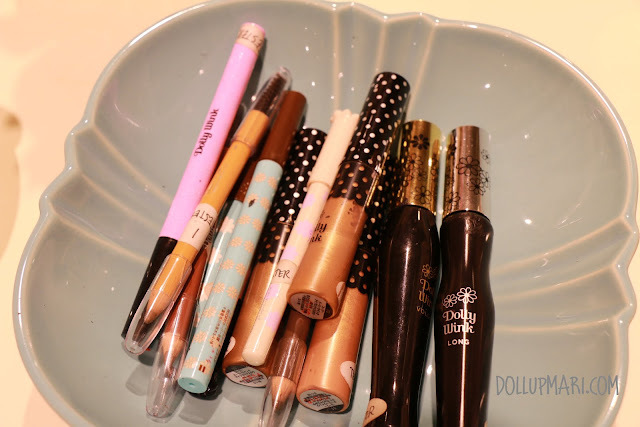 They also have eyebrow mascaras at Php550 per tube. They have a golden colored one (#2) and a more mellow (yet metallic and pearly in color) brown one (#3). 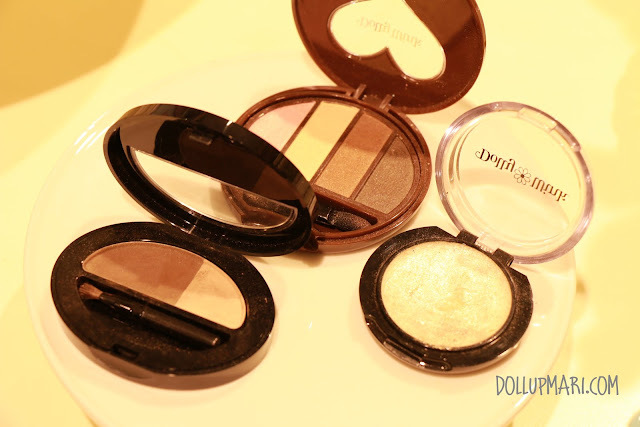 They also have the complete lineup for the basic eyeshadow quads at Php800 a pop. 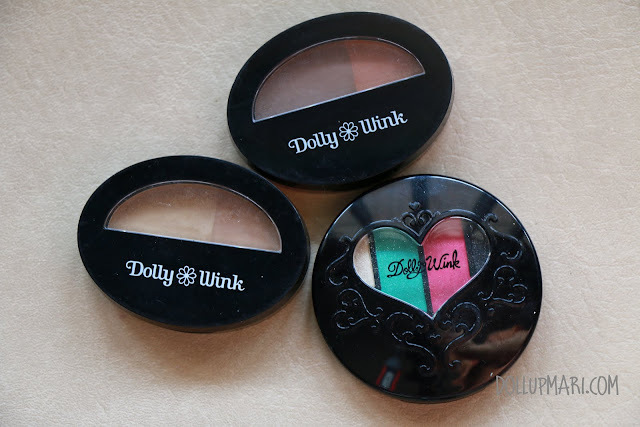 The official Dolly Wink line has 2 more eyeshadow quads in a special collection, and back then they used to have crazy colors. Now it's all brown and mellow. And they also have Eye Talk! This is like my holy grail eyelash glue, and this has also been a savior of monolids for many years now (the pink regular eyetalk is Php430, the clear one is Php450, and the sports-approproate one is Php600). 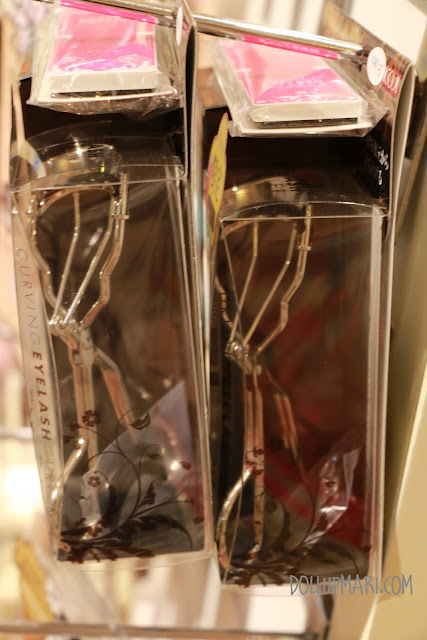 They also have Koji's eyelash curlers. 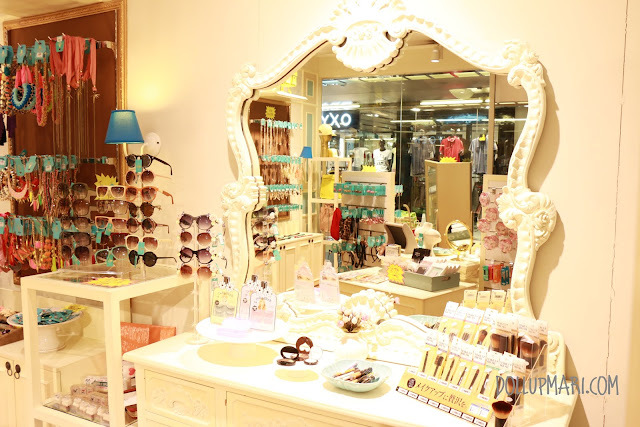 The store's interior is girly and whimsical in general. The testers are more complete for the pencil and tube type products as they only have one tester for eyebrow powder and one for eyeshadow. That's the #3 eyebrow powder. They don't have this in stock right now, but that's what they have testers for. So ironic. It looks waaay darker in real life, trust me. They have a tester for the eyeshadow quad in #2 or pink brown. And the eyeshadow on the right is their cream eyeshadow (Php550). The old kind used to have two colors, but this revamped edition just has gold for now. I actually used to not mind this in all the times I've been to Hong Kong because I thought that this was tacky and was opaque. the moment I tried this tester did I realize that this was actually the bomb. It packed a lot of glitter, did not crease easily, and did not feel sticky or tacky. This is a perfect topping glitter for any powdered eyeshadow, and can be worn alone with almost no problems. They have several eye pencils, one in black, one in brown, and another in cream for the tear duct area (each one is Php500 I think). They have a lengthening mascara and a volumizing one. And they have eyebrow pencils aside from the powders and mascaras. Here are some more eyelashes, and their eyelash case in action. DW has an eyelash case (Php250) for those who do not plan to bring the giant packaging with them on travel, and for those who want a section for upper and lower lashes, hence the divider in the middle. In this case, too, there are some lower lashes that are in small chunks that it's easier to keep them separate from other lashes lest they might get lost or damaged when tangled with the others. These are the pencils I was talking about. 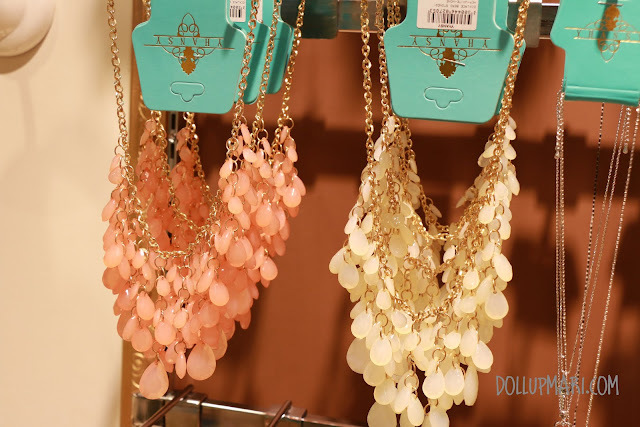 I haven't tried these yet, but would definitely love to add this to my collection, especially the pearl colored one on the right. And these are DW's lashes. 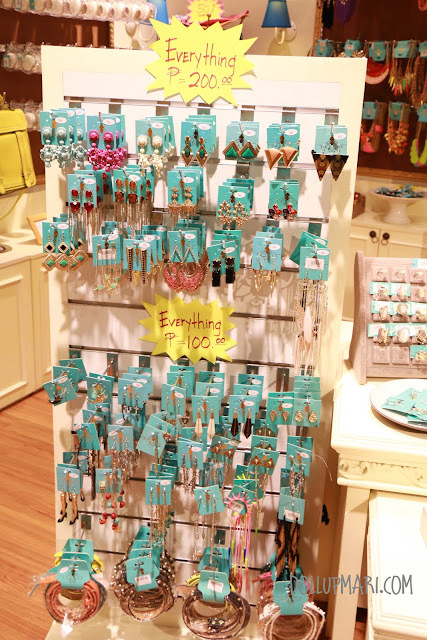 Each box has 2 pairs, and each box is Php700. I know all of you are going to complain to me that this is too expensive, but let me tell you that if you really love falsies, this is going to be a really good buy because they have the prettiest lashes. And if you're careful enough, each pair can be reused at least 20 times so it's more of an investment than a waste of money. This is the pair of lashes that gets me compliments all the time, be it in real life or on my YouTube videos. Be sure to get this when you visit the store. Too bad they still don't have the special edition promo pack as I got my box of these lashes from Sasa Hong Kong and the lashes were at about Php500 for 3 pairs. This one will probably be a popular choice for a lot of girls, and I bought one of these from Yhansy about three weeks ago. It's a bit more tamed compared to #9, but more or less the two kinds are very similar in effect. They make the eyelashes look really lush without being obviously there. I'm eyeing on these lashes and will most probably get them in my next store visit. And this is another piece of good news for all of you. You may have seen me mention my Koji curving eyelash curler countless of times in my tutorials, and well you can now get it in the Philippines for Php900. 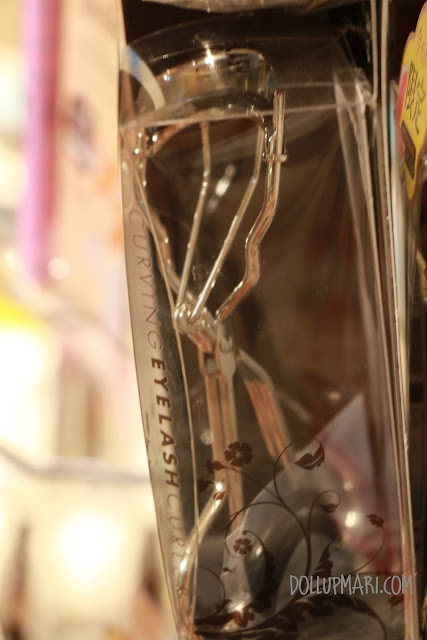 As in this is the only eyelash curler that deserves to be worshipped in all of eyelash land, I MEAN IT. 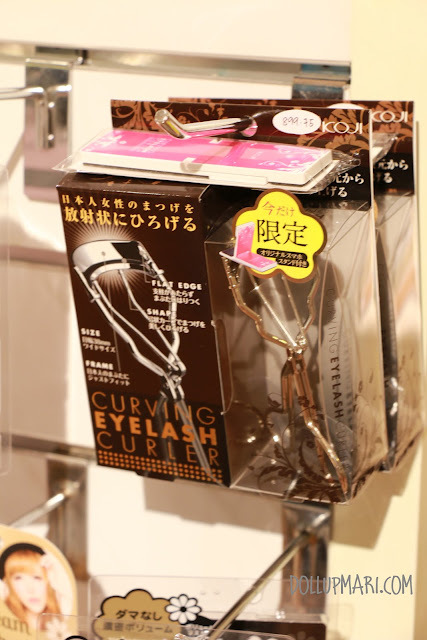 This is the only eyelash curler that is curved both ways, as in the metal is curved as your usual eyelash curler, but the metal is curved upwards. What this means is that you can get all of the hairs in one swoop (no need for those corner curlers anymore), and you can get really really close to the lashline comfortably with little risk of pinching yourself. As in all you girls out there do yourselves a favor and get this today. 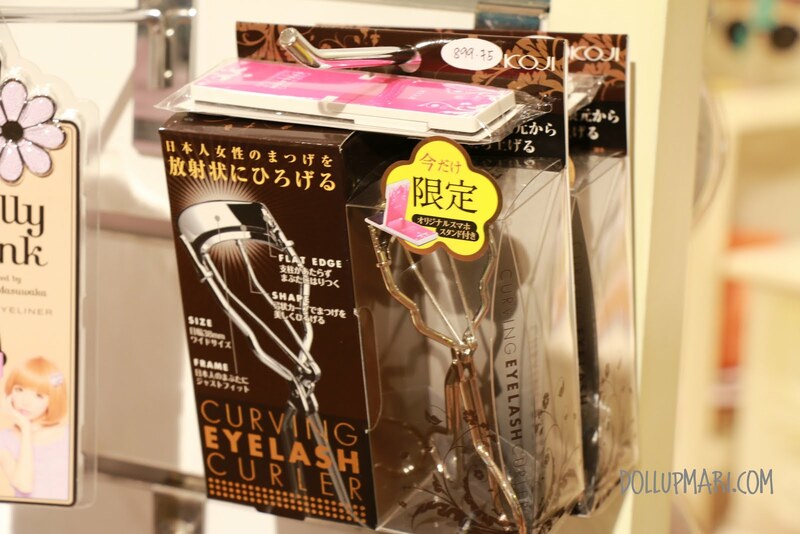 I think what I'm trying to say is more apparent when you see and try the eyelash curler for yourself. And here are some of the other makeup tools under the Koji brand. 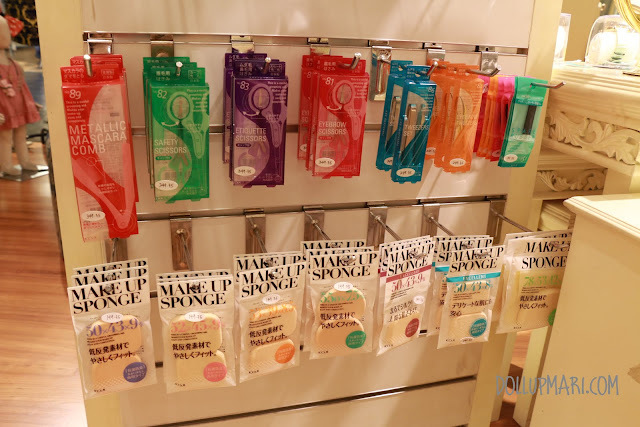 They have special cosmetics scissors, as well as tweezers, eyebrow shavers and metallic eyelash combs. I highly recommend those safety scissors for those people whose eyebrow hairs grow quickly, as in for the people whose eyebrow hairs are in the right place but are just too long. You can use these scissors with ease and peace of mind that they're safe. The one listed as eyebrow scissors on the right are too pointy for me, and will probably scare the next girl. 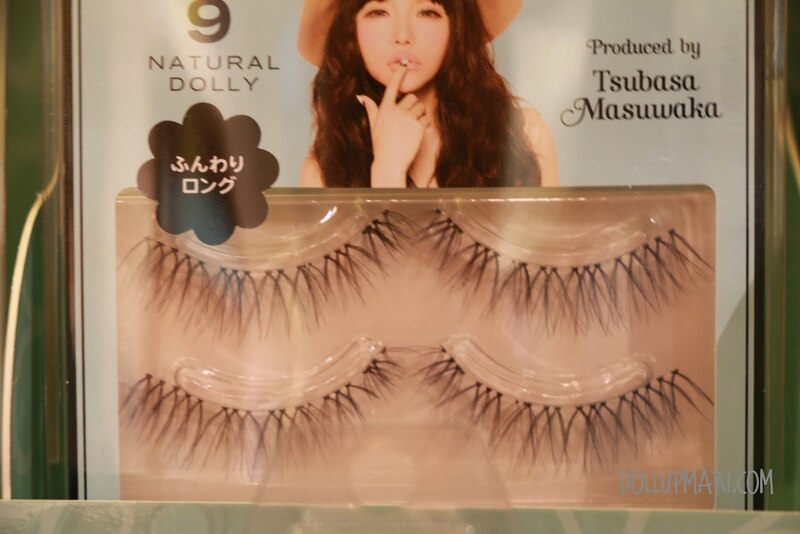 I think they'd do better as a scissor for false eyelashes. I have no idea what the etiquette scissors are for though. 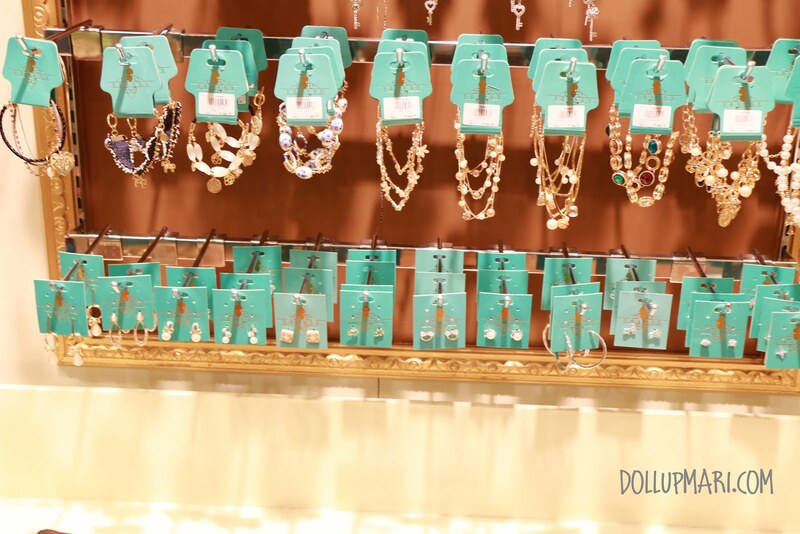 For the younger girls, and for those on a budget, don't fret as they also have the entire Spring Heart brand in here. Spring Heart is their lower end brand, as in each pair of eyelashes is Php250, compared to DW's Php350 per pair. And they sell lashes per pair, so you don't need to make such a commitment right away. 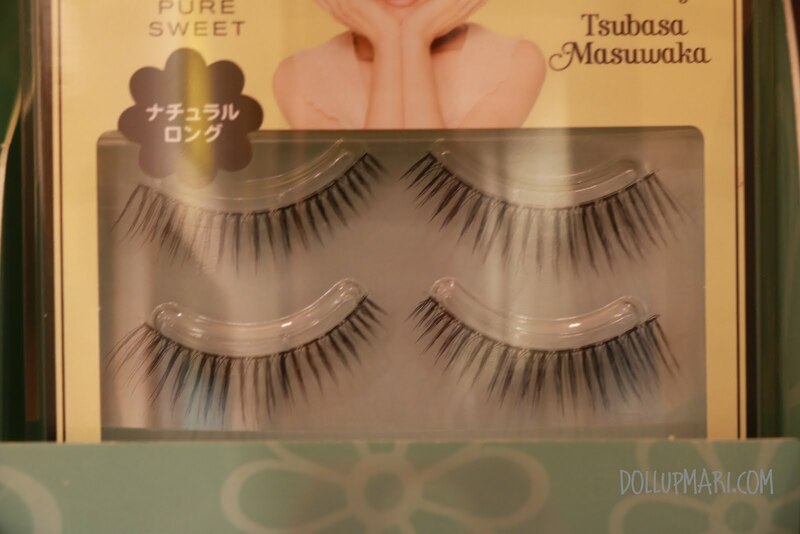 The lashes' bands are also short to accommodate the regular girl's needs as DW's eyelashes are purposely longer so gyaru's could create a different effect on their eyes. 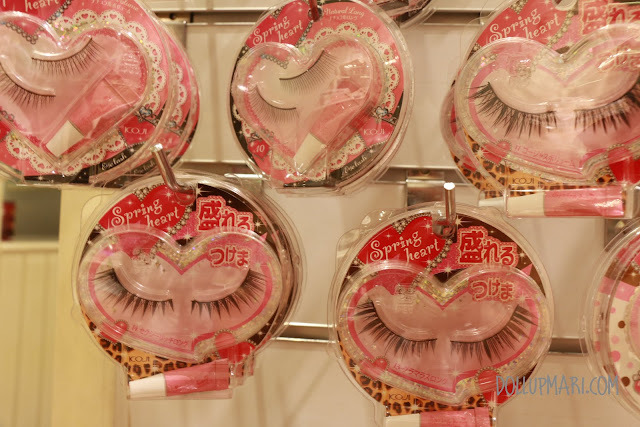 If you have a kikay person to give a gift to and you're on a budget, you can definitely consider these lashes from Spring Heart. For a princess-ey feeling, you can get the criss cross lashes on the upper row. And this is Lash Concierge. I have yet to know more about this brand as it seems new, and by far it hasn't made rounds in the Hong Kong scene yet as of this April. These seem to bne really natural lashes targeted to the office lady for everyday wear, given the poster girls on the boxes. 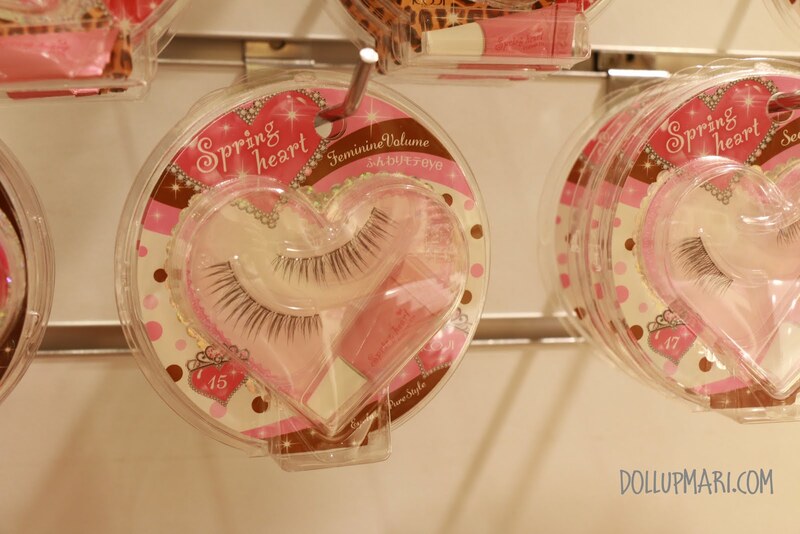 I guess they made a brand like this because not everyone likes the drama in DW lashes (and some people either do not know how to cut or are not willing to cut the long lash bands), and for the more matured women I think Spring Heart might come off as a childish brand. The prices are between Spring Heart and Dolly Wink, too. Lashes are sold at 2 pairs for Php500. I know the concept seems weird for Pinays, but for Japanese people, it's absolutely normal to wear false eyelashes everyday. It's normal to wear falsies to work, to school, and at times this is more or less what brings together the whole look. 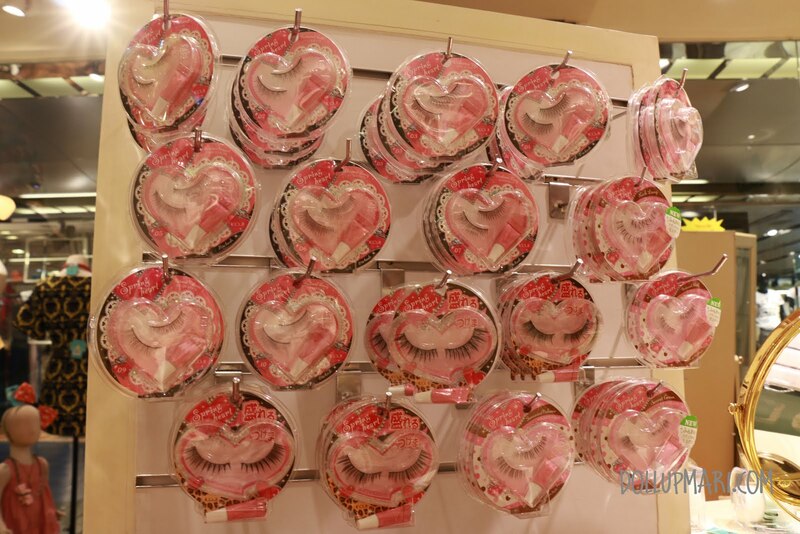 I look forward to a Philippine society that accepts regular false eyelash use. And yaaay these are my purchases at the counter. This batch of bags is unfortunately flimsy, so please do not use these bags for heavy items. I guess they were really just meant for eyelashes hahaha. My haul has one pair of Spring Heart eyelashes (in Feminine Volume), a pan of cream eyeshadow (because I discovered on the spot how good it is), and a Koji brand tweezers set so that I needn't rely on the tweezers from my Too Faced brow envy kit whenever I do my eyebrows. 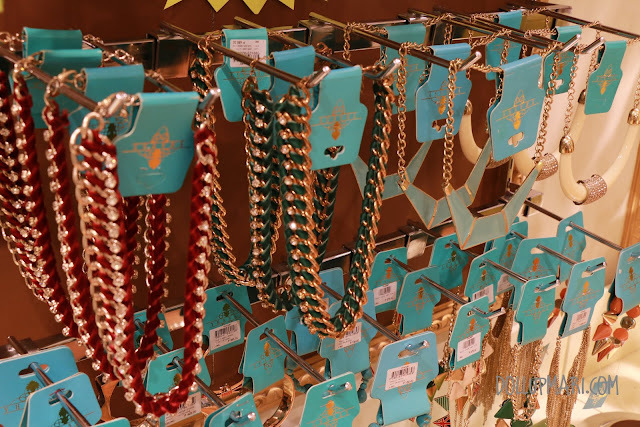 And since I've been talking about Koji and its brands all this time, here are some photos of the other things for sale in their store. And hooray! This is my current Dolly Wink collection! These are my DW #11 and #8 lashes which I got from Yhansy. 11 is upper and 8 is lower. I also have their upper lashes in #9 (which gets me loads of compliments) and #1. I got both of these from Sasa in Hong Kong. This is my newly purchased Cream Eyeshadow from Yhansy and my Mascara and eyeliner set from Sasa Hong Kong. And these are my eyebrow powders and my eyeshadow quad. The chocolate brown eyeshadow quad is on the upper row and the honey brown eyeshadow quad is on the lower row. 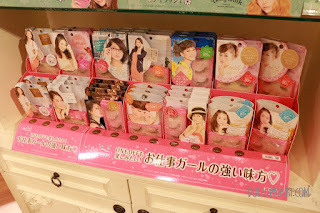 Chocolate brown is from Sasa Hong Kong and Honey brown is from City Super Taiwan. My eyeshadow quad is from their older collection, which is why there was none of it at Yhansy. I got the quad from City Super Taiwan. And here's just another photo from my mini-haul last Sunday. And I know that I will be flooded with complaints from people who do not live near Shang Plaza so here's a list of all their partner shops selling their stuff. 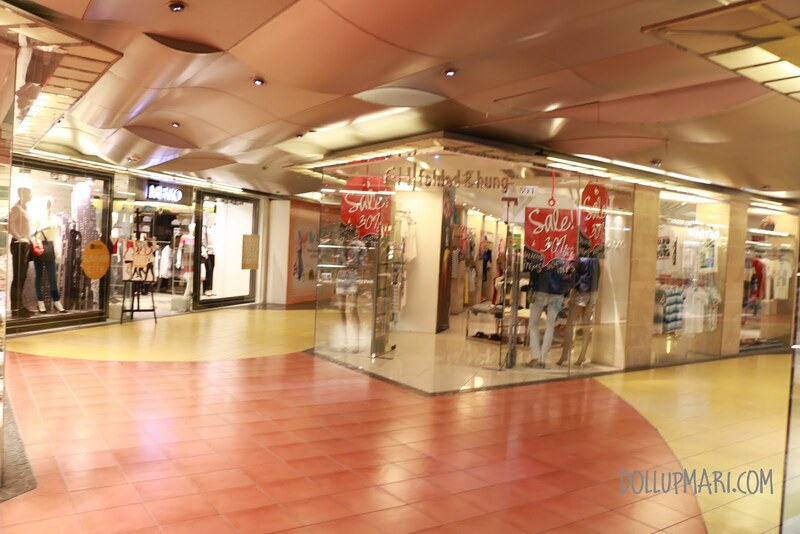 At this rate there's going to be a Dolly Wink outlet near you given that they have it in the extreme south at ATC and the extreme north at Trinoma. 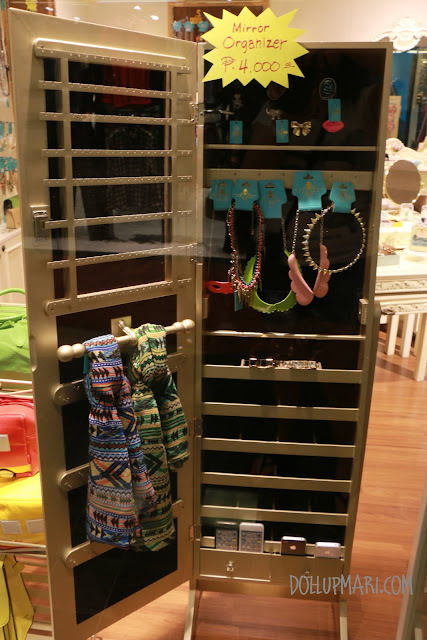 And they also accept online orders so even those who are not in Manila can get their fix, too. So that's it! I hope this post has been of help! 5th floor (store #592) of the old wing of Shangri-La plaza. Viber/SMS: 0947-893-6818; for inquiries or online orders.